Once struggling to find exactly where they fit into the market, Honor has nestled quite well into the sub-flagship premium niche and the bang-for-the-buck bargain category. Last time I (Daniel) owned an Honor device, it was the Honor 8 Pro, a device that had respectable specifications but ultimately failed to stand out. Since then, Honor has proven it can innovate with the Honor Magic 2 slider phone. Now, the company has proven its mettle once again with the Honor View20, a smartphone that holds its own against the very best of early 2019. We’ve already given our broad overview of the View20 in our video review, and we’ve extensively tested its camera performance (which is outstanding). Today, we are going to take an in-depth look at its gaming performance. How well does the Honor View20 perform when playing the top Android games from Google Play? Let’s find out. Disclaimer: Honor sent us both a View20 for review. Honor is also a sponsor of XDA, however Honor did not have any say in the content of this article. Honor—a sub-brand of Huawei which specializes in online sales—is the only other brand that sells smartphones with the HiSilicon Kirin line of processors. While past devices powered by Kirin chipsets delivered a good bang-for-the-buck in terms of raw CPU performance, their GPU performance used to significantly lag behind Qualcomm’s Adreno GPUs. HiSilicon acknowledged this discrepancy and attempted to bridge the gap with its newer flagship chipsets. The HiSilicon Kirin 980 that powered the Honor View20, for instance, uses the ARM Mali-G76MP10 GPU which Huawei claims will offer 46% greater graphical processing power and 178% improved power efficiency over the Mali-G72MP12 GPU found in the HiSilicon Kirin 970. The Honor View20, therefore, is using HiSilicon’s most powerful chip yet. To further augment the View20’s gaming capabilities, Honor says the device has a “9 liquid cooling system” that should result in a 5° C improvement in temperatures. Hardware isn’t the only thing going for the View20, however. Since the Honor View20 runs on Honor’s Magic UI 2.0 (based on Android 9 Pie), it has support for GPU Turbo 2.0. Huawei and Honor both implemented a feature called “GPU Turbo” back in mid-2018. The feature aims to deliver better and more stable performance in games by allowing games to take better advantage of the hardware. The main benefit of GPU Turbo is to improve the reliability of gaming performance. It’s not enough to just look at the maximum and average framerates, you have to also look at how stable the framerate is. A device with a lot of lag spikes during gameplay will have an awful gaming experience, which is what Huawei and Honor wanted to avoid. GPU Turbo 2.0 simply pushes the gaming performance even further in certain games. GPU Turbo 2.0 supports PUBG Mobile, Mobile Legends: Bang Bang, Vainglory, Arena of Valor, Rules of Survival, and NBA 2K18, so if you’re a fan of one of those games you should have a great experience when playing them on the Honor View20. Before we move on to the data, let’s briefly talk about what it’s like to game on the Honor View20. The Honor View20 doesn’t have a notched display in the traditional sense. Rather, it has a single hole that measures 4.5mm in diameter near the top left corner of the 6.4-inch display. This display hole sits in the status bar area and pushes the system status bar icons to the right a little bit. Thanks to this hole, the Honor View20 manages to have an incredible 91.82% screen-to-body ratio, which means almost the entire front-side of the phone is a viewable area for games. Now you might ask if the display hole gets in the way of games or not, and the answer is that it really doesn’t. Because the hole is offset to the left, it sits to the bottom left when you’re holding the Honor View20 in landscape orientation. Since most games don’t really display any useful information or interactive elements in that area, the display hole doesn’t cover up anything important. You can choose to hide the hole when playing a game—most games default to showing the hole—but we recommend you don’t if you want a truly immersive experience. Here’s a side-by-side comparison of what it looks like to hide the hole (left) versus show the hole (right) on the Honor View20. The game shown in the images is Darkness Rises, one of the games we tested below. Honor View20 with display hole hidden. Honor View20 with display hole shown. 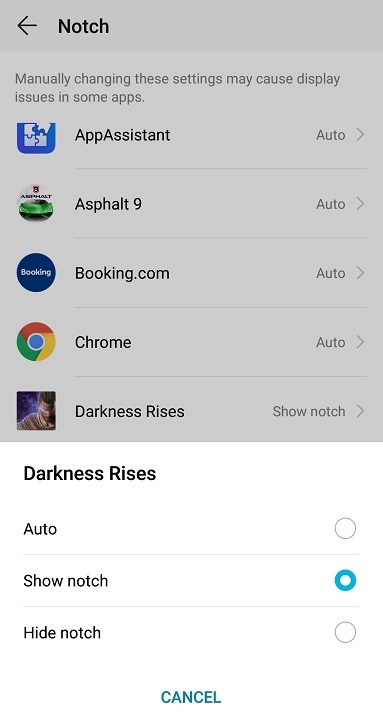 Users can control whether the display hole is shown on a per-app basis by going to Settings > Display > More display settings > Notch. A few games won’t stretch to fit the entire screen, because the Honor View20’s display has a resolution of 2310×1080 at a 19.25:9 aspect ratio. If some games don’t fit properly, then you can go to Settings > Display > More display settings > Full screen display and force the app to scale. The IPS LCD panel is pretty decent quality, though we don’t have any display measurements to quantify its color reproduction, brightness, etc. In my (Mishaal’s) view, there were no glaring problems with the screen after gaming on the View20 for multiple hours in preparation for this post. The single bottom-firing speaker probably won’t drown out noises in a large room, but the inclusion of a 3.5mm headphone jack should satisfy any gamer or mobile enthusiast. As for RAM, storage, and battery, we’ll talk more about those aspects below. Now, let’s move on to the testing. The following gameplay performance data was recorded using GameBench, an excellent service that helps you analyze gaming performance on Android and iOS. GameBench has desktop clients and mobile clients. We used a mix of the Android mobile client and the desktop client for our review. Due to issues resulting in the service occasionally being killed, only 5/12 of the tests were untethered from a PC/using the mobile client. We specifically picked out some of the most performance-intensive Android games on the Play Store. Although these games can run fine on many devices, you’ll need a flagship-quality device like the Honor View20 if you want to max out the graphics in all of these games. We played every game using the maximum quality settings that were available. We skipped dialogues, tutorials, system messages, microtransaction peddling, etc. so we could record as much gameplay data as possible in each session. When the popular battle royale game Fortnite first launched on Android, it was only playable at a maximum 30FPS. Only the highest-end Android devices could run it comfortably, though the game has been optimized in the months since its release. At the Honor View20’s international launch event, it was announced that the View20 would be one of the first smartphones to support playing Fortnite Mobile in 60FPS. Later in January, the promised update to Fortnite brought 60FPS support on the Honor View20. We’ve been eager to test Fortnite‘s performance with the latest update, but Fortnite‘s restrictions prevented us from using GameBench while the game was running. Thankfully, the team at GameBench had a solution. They invited us to their headquarters to try out an in-development build of GameBench that works with Fortnite, so we were able to record some data from the game while playing it on the Honor View20. TK Bay from our XDA YouTube channel went to GameBench’s office to grab the data for us. Because the GameBench build was still in-development, it required us to tether the device to a PC so we couldn’t collect the estimated playtime. We also couldn’t get screenshots, CPU load, memory usage. Here’s a widget provided by GameBench as well as the raw data they captured during our gameplay session. During the approximately 18 and a half minutes of gameplay we captured, the Honor View20 easily handled Fortnite Mobile at 60FPS. The median FPS during actual gameplay was 59 while the minimum FPS was 51. This is a major improvement in gameplay performance considering how much trouble the Honor 10 with the Kirin 970 had when we first tested Fortnite. Love it or hate it—I (Daniel) am firmly in the latter category—PlayerUnknown’s Battlegrounds is one of the most popular games out there. Its playerbase spans the globe with players enjoying this battle royale shooter on PC, console, and of course, on the smartphone. It’s hard to tell when you’re shooting at bots or really inexperienced players, which can make the game seem really easy when first starting out. The Honor View20 performs nearly flawlessly in this shooter, matching the OnePlus 6T in terms of median FPS at 40FPS during our first playthrough. The stability during gameplay was excellent, as the device rarely dipped below the FPS cap. We followed up with a second playthrough that was untethered, and it performed just as well. At 50% brightness and without performance mode enabled, the Honor View20 is estimated to last about 10 hours during continuous gameplay of PUBG Mobile. The Honor View20 does get a little warm near the camera when playing PUBG Mobile, but nothing that’s overly uncomfortable (the battery temperature never went above 40°C). With a decent case, you probably won’t notice it that much. Asphalt 9 is one of the most popular racing games on Android, and it looks gorgeous to boot. The game does a lot of hand holding and really pushes you to buy upgrades, but you can ignore all of that if you just want to smash some cars while going turbo. Once again, the Honor View20 performed admirably, maintaining that 30FPS target with 95% FPS stability. Asphalt 9 never really caused the View20 to heat up, so you can play comfortably for long hours—almost 6 and a half hours, in fact. ARK is a survival game that has you stranded on an island full of dinosaurs. You have to craft basically everything from scratch, and you have to watch what you eat or you’ll die of starvation. The game is notoriously resource intensive on all platforms, and that’s no different on Android. We upped the graphics and all other settings to the max, and the Honor View20 still managed to give us a decent experience, albeit we found it necessary to turn on performance mode. Although the 24FPS median framerate fell short of the 30FPS target, it was quite stable with 91% FPS stability. ARK isn’t the kind of game that needs fast response times, though, so the performance here is acceptable. Be warned that the Honor View20 can get really hot near the camera if you decide to play ARK at maximum quality settings with performance mode enabled (the battery temperature peaked at 47°C at the end of our nearly 22 minute session). Darkness Rises is a hack and slash game with God of War-esque monster finishes (though nowhere near as flashy). As you start out, you can win by basically spamming the attack button with the occasional dodge. However, as you progress you’ll quickly find it necessary to actually learn the enemy attack patterns so you don’t get hit every time. Fortunately, the enemies all telegraph their attacks pretty heavily, so you should have no trouble recognizing when an attack is about to hit. There’s a cooldown on the dodge roll, though, so you can’t just spam it. The best way to play Darkness Rises is with the graphics set to max quality with 60FPS unlocked. By default, the game looks blurry and is locked at 45FPS. The Honor View20 can easily handle the game at its best. With a median FPS of 60 and 94% FPS stability, the Honor View20 almost never lags when playing Darkness Rises. The phone doesn’t ever really get hot, either. You can play the game for almost 6 hours if you want. That number is based on us playing at 50% brightness without performance mode enabled, which isn’t really necessary for this game. Hitman is an iconic stealth action game series that has the player take the role of Agent 47, an assassin for hire. The console and PC games allow the player to control Agent 47 as he infiltrates his target’s residence or base of operations, employing whatever tricks are necessary to kill the target without being detected. Sniper, however, has Agent 47 perched far away from the target, armed only with a sniper rifle. The goal is to take out the target from afar by either shooting directly at targets or destroying the environment to cause the death of a target. There’s not really much for us to say here—the Honor View20 handles Sniper like a champ. The View20 hits the target 60FPS almost always, with an FPS stability of 95%. Go snipe targets for hours on end, Agent 47. Fans of DC Comics look at Marvel movies with envy, wishing that their favorite superheroes and villains could also get a proper big screen treatment. Fortunately for them, games based on the DC universe are pretty decent in comparison. Injustice 2 is one such game. It’s a 2D fighting game that lets you play as Batman, Superman, Aquaman, and other DC characters. Injustice 2 lets you get pretty much straight to the action as soon as you install it, so it’s a great way to kill time on your phone. The game is capped at 30FPS, though we wish that 60FPS would be supported since we’re sure the Honor View20 will be able to handle it. You shouldn’t have any problems playing Injustice 2 on the Honor View20. The battery temperature never rose above 35°C, and there’s rarely ever any lag during actual fights. The 89% FPS stability shown below has more to do with the many, many transitions and loading screens you have to go through. You can thus comfortably play Injustice 2 for hours on the View20. Life is Strange is one of those games that’s perfect for mobile, even though it’s rare to see such a game on mobile. Originally released for consoles and PCs, Life is Strange tells the story of Max Caulfield, who has the power to rewind time. It’s an interactive, episodic game that’s more focused on the story than the gameplay. What gameplay it does have translates well to mobile. The port was well done, too. There is virtually zero lag when playing Life is Strange on the Honor View20. MMORPGs are quite limited on mobile, but there are a few games that still make it work. Lineage II: Revolution is one of them. With auto-questing and even auto-combat, a lot of the mundane aspects of MMOs have been simplified, for better or worse. Lineage II: Revolution has pretty decent animations, mob and player models, and textures for a mobile MMO. It looks and plays really well on the Honor View20. The View20 is almost able to sustain 60FPS during gameplay, with only the occasional dip in frames. The View20 can get a bit warm while playing Lineage II: Revolution at the absolute maximum settings, though. The highest battery temperature I observed after about 20 minutes of gameplay was 43°C. You’ll notice that most of the games we played were only played for a little over 20 minutes. That’s because GameBench recommends recording at least 15 minutes of gameplay for accurate results, so we opted to be safe by recording 20 minutes to account for loading screens and menuing. Rangers of Oblivion, however, roped us in for a little over 40 minutes, because it’s actually pretty fun. It’s a mobile MMORPG like Lineage II: Revolution, but the combat feels much more fluid. Of course, Rangers of Oblivion is still a mobile game, so there’s a lot of limitations in terms of the animations, graphics, and especially in how many characters and monsters can be seen at a time. That being said, the game looks really good when you install the optional HD graphics pack. The Honor View20 handles Rangers of Oblivion with ease. There are rarely any drops in the framerate during combat or exploration in the field or towns. The phone doesn’t get hot during prolonged gameplay, either. The battery temperature never went over 37°C, to be precise. Strangely, the data that GameBench uploaded to the cloud was missing the estimated playtime, even though it was present on the device. The data we saved on our phone shows that you should get about 7 hours of gameplay in Rangers of Oblivion if you set the Honor View20 to 50% brightness and don’t turn on performance mode, which is unnecessary for this game. Rome: Total War is one of the least expected titles to launch on Android. It’s a strategy game that requires a lot of micromanaging of troop positioning, so it doesn’t seem like something that would work without a keyboard and mouse. Somehow, it works. I (Mishaal) used to play a lot of Rome: Total War and Medieval II: Total War back in the day, so I’m glad to see such a high-quality game make its way over to Android. I played two quick historical battles with the maximum graphical settings and the highest number of troops visible on screen. I ordered all troops to charge against the enemy army in the dumbest way possible just to see how the Honor View20 handles all the troops clashing at once. With the device’s performance mode enabled, it handles Rome: Total War wonderfully. The Honor View20 rarely suffered from lag, though it did get pretty warm when playing. In hindsight, performance mode isn’t really necessary for Rome: Total War, so you can save yourself the trouble and play the game without it enabled. You should be able to enjoy the game on the View20 without any issues after you get used to the control scheme. Since Call of Duty: Legends of War shut down its beta testing servers, we decided to test Shadowgun Legends instead. Legends is a surprisingly demanding mobile shooter once you unlock 60 FPS and increase the graphical quality to the maximum. In fact, the Honor View 20 can’t maintain a stable 60FPS, only managing a median FPS of 56 with an FPS stability of 85%. That doesn’t mean you’ll have a poor experience, however. Most guns in Legends automatically shoot when you point them at an enemy. Plus, the enemies are quite generous with their attack timings, so you shouldn’t have any issues playing the game on the View20. Be warned that the device does get quite hot during gameplay at max settings, and you’ll only have about 3 hours to play at these settings on a full charge. Legends does warn you about the consequences of playing the game at max settings, though. Here’s a table that summarizes our testing of 12 of the top Android games from the Google Play Store. Note that all games were played at the maximum quality settings that were available. We also played at 50% brightness because you probably won’t be playing these games out under the sun where 100% brightness is needed. The game titles all link to the GameBench sessions that we recorded, save for Fortnite Mobile which was recorded in a controlled setting at GameBench’s office. *Data was captured using an in-development build of GameBench, thus all of the usual data could not be recorded. **A bug caused the FPS data for this session to not be recorded. An earlier 10m session showed the Honor View20 can easily sustain 40FPS. The FPS stability was 95% and the variability of that session was 1.49FPS. The Honor View20 comes with either 6GB RAM and 128GB storage or 8GB RAM and 256GB storage. The storage cannot be expanded via a microSD card or NM card. I (Daniel) have the 6GB RAM model with 128GB storage, while I (Mishaal) have the 8GB RAM model with 256GB storage. Memory management is something that is difficult to measure on the Honor View20, or any Android device for that matter. The phone has one of the more aggressive battery management software setups, resulting in apps frequently being killed in the background unless you explicitly whitelist them. Fortunately, there’s a way to disable this aggressive background memory management. Apps in the foreground are safe no matter if you choose to tune the software’s memory management or not. During our time with the phone, we never had a situation where music, podcasts, or games were actively killed while using them. Software aside, there’s little difference between the 6 and 8GB RAM models when it comes to the gameplay experience. As you can see in the table above, most games eat up around 1GB RAM at peak usage. Only ARK: Survival Evolved neared 2GB RAM usage. If you get an 8GB RAM Honor View20, you may see fewer apps get killed in the background after you play a game, but it’s not an improvement that’ll make a huge difference in your day-to-day usage. The increase in storage from 128GB to 256GB, however, may be worth the upgrade. If you plan on taking a lot of 48MP pictures or downloading a ton of games, music, and videos, you’ll definitely want to opt for the 256GB model. The Honor View20’s battery is large for the affordable flagship market, coming in at 4,000mah. We never had to worry about battery life when using the device during a few weeks of on and off usage. Honor and Huawei are known for putting rather large batteries in their devices without many compromises in other departments. Unlike the primary competitor to the Honor View20—the OnePlus 6T—the View20 retains its headphone jack, an IR blaster, and rear-mounted fingerprint sensor without sacrificing battery capacity. 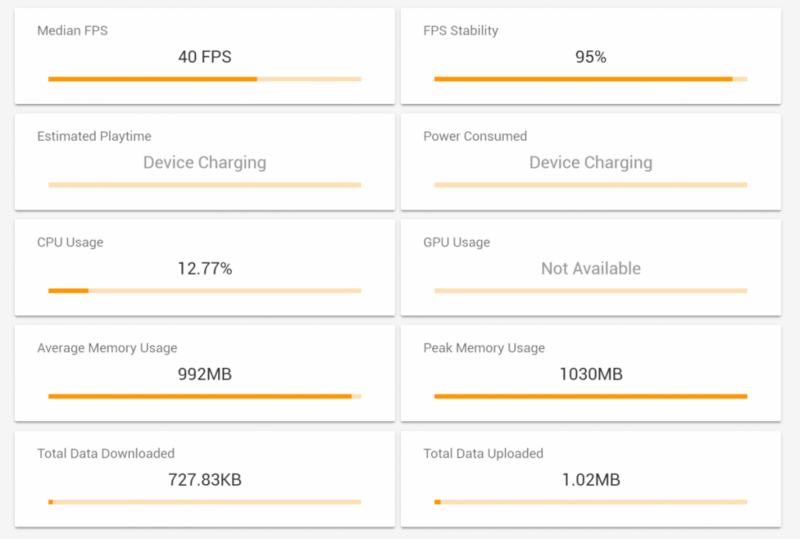 PCMark is a benchmarking application that tests the system performance by repeating day-to-day tasks to give you a score and battery life result. The application requests that you set the display to 200nits of brightness but since we do not have precise light meters that can give us this result we set the display to a comfortable brightness level and switched off auto-adjust (Honor’s name for auto-brightness), resulting in about 30-40% brightness. In this test, the Honor View20 achieved over 15hrs on PCMark’s battery benchmark, though it didn’t quite achieve the performance scores that the OnePlus 6T got in Adam’s testing of that device. As I mentioned earlier, Honor and Huawei are known for stuffing large batteries into their devices and the Honor View20 is no exception—battery life is one area where the View20 shines. Storage speed is one of the most important aspects when it comes to performance. Slow storage will hamper app and file loading times and will make games stutter as they attempt to fetch game assets. This is one area where we were stunned by the performance. Compared to the OnePlus 6T Adam had in January, the Honor View20 handily outperforms it in AndroBench. While the delta between the two is not much in terms of Sequential Read and Write, the Honor View20 beats the OnePlus 6T’s result in Random Writes, delivering a result at 100MB/s faster. This is certainly one area that Honor did not skimp out on, and you can certainly feel it when zipping through loading screens in games on the View20. The Honor View20 is not marketed as a gaming phone like the Razer Phone 2 or ASUS ROG Phone, but if you do decide to game with it, you won’t be disappointed. The Kirin 980 does a great job sticking close to one of the most performant Snapdragon devices on the market, the OnePlus 6T. The screen is excellent for gaming, and the notch-free design really allows you to be immersed in the gameplay. Through our testing of these games, we never had an issue where the camera cutout got in the way of us enjoying the game or blocking some sort of interaction. The Honor View20 does lack some useful software features like a dedicated Gaming Mode that allows you to set the device performance and hide notifications according to your preference, to eke out a little more battery or block your spammy friends from preventing your Chicken Dinner. If gaming is your sole objective, you might be better suited with one of the aforementioned gaming phones, but I’d wager none of those devices can compete with the Honor View20’s camera performance. Overall, the Honor View20’s gaming performance shows that the brand is not afraid to go toe to toe with OnePlus or even dedicated gaming phone brands. Ultimately, whether you want to buy the device comes down to your preferences on other aspects like the software, design, pricing, etc. We’ve demonstrated that the View20 is an absolute champ at handling the highest-end Android games, so there’s no question it’ll satisfy your gaming needs. We’ll be testing the Honor View20’s performance in emulation next, so stay tuned for part 2 of our performance testing. For our overall thoughts on the Honor View20, visit our hands-on article, full video review, and camera review. If you want to buy the View20, check out HiHonor.com in your region or some of the links below. The Honor View20 has been unveiled in launch events held in China, India, and France, but the smartphone is also on sale in the United Kingdom, Italy, Germany, Russia, Poland, Czech Republic, Spain, Finland, Egypt, Saudi Arabia, Singapore, Portugal, United Arab Emirates, Belgium, the Netherlands, and Malaysia. You can buy it in Sapphire Blue, Midnight Black, Phantom Blue, or Phantom Red. The Sapphire Blue and Midnight Black variants come with 6GB RAM and 128GB storage while the Phantom Blue and Phantom Red variants come with 8GB RAM and 256GB storage. The pricing of the Sapphire Blue and Midnight Black is €569/£499/₹37,999 while the Phantom Blue and Phantom Red cost €649/£579/₹45,999. U.S. availability has yet to be confirmed. We recommend you subscribe to the XDA forums for the Honor View20 where you can chat with others about the best tips, tricks, mods, accessories, and more.